Great news. According to the Guardian, a Newcastle-based museum has acquired the original typescripts for nine of Enid Blyton's best-known novels. 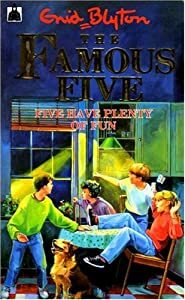 Even better, one of them, Five Have Plenty of Fun came with a handwritten note form the author stating, "I do not write my books by hand but type them straight out of my head." I find that quite fascinating, especially given that this best-selling author wrote more than 700 books! I can see that I'll have to make another trip over to England one of these days to do another walking tour (I love Europe for walking) and I'm pretty sure that Newcastle and the Seven Stories Museum will be on my itinerary. Yes...I am a bit of a nerd, having walked to various literary sites such as Virginia Wolf's The White Garden at Sissinghurst and Wordsworth's "Tintern Abby" and the childhood cottage of Rabbie Burns, but in my defense, I don't have to spend money on a gym membership!